Berlin has incredibly talented Acrobats, Acroyogis and Creative Movement Artists. It is great to offer a gathering and open those talents to the world 🗺️! 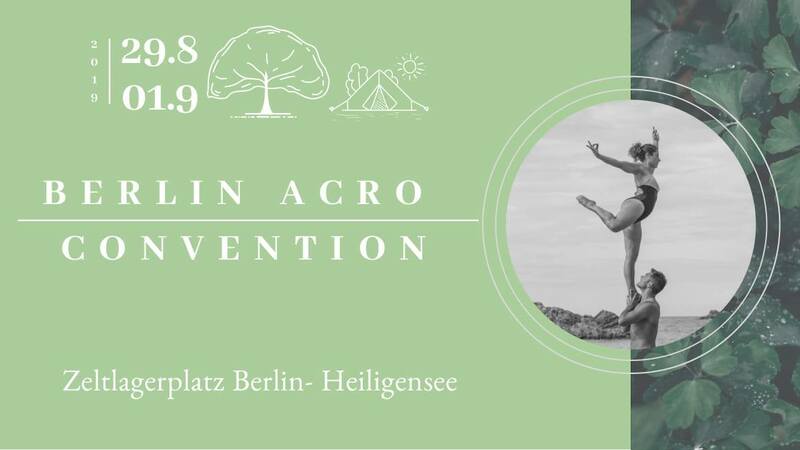 This event is created to shed light on the Berlin Acro scene and environment, as well as inviting amazing international teachers to learn from each other, supporting authentic, passionate sharing and each individual’s gift. This convention will be all about raising the value of this beautiful practices, the awareness of this Arts and bring it to as many people as we possibly can in a healthy, safe and authentic environment. Starting on the evening of Thursday the 29th of August going straight until the afternoon of Sunday the 1st of September 2019. We think that kids are enriching our lives and we want to give the possibility to parents to join too, that is why we will organise kid’s acro classes and child care too (if there are enough kids)! We are still working on the logistics for this, but it is in place! Ok i am in, it could not be better… Could it? Saturday night will be Showtime! An evening of performance and creation, will take place to bring everyone together and enjoy the talent of amazing artists and yeah… we are planning an aperitif style dinner! But chill with them drinks🍻 cause there is still training on sunday!